Pro-Ject MaiA Integrated Amplifier Compact Stereo Hi-End. Also this amp is highly sought after audio for Vinyl Lovers. It has Phono Input. built-in headphone amplifier with full-size (1/4") output. Yaqin model MC100 B. uses KT88 Tubes. Tube Power amplifier. power cord is included. There isnot a lot Shure amplifiers built over the years. AVC-20 was built in Japan but designed and created in Shure's labs. The front panel is very well illuminated and the large "X". This is one very nice amplifier, i tested it with my Technics turntable and my Sansui Reel to Reel deck - beautiful worm and musical tone, very powerful deep bass and clear trebles. This is a premium headphone amplifier with a pair of AD825 IC. It is upgraded from a Creek OBH-11. 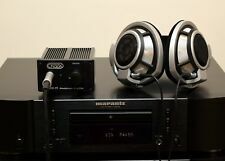 The amplifier has been tested with following headphones using Marantz SA8001 and CD6006 CD players. It sounds gentle, sweet, as charming as rose. It is particularly suited to play idyllic ease and elegance of classical music. They are good choice for people who hanker for the “Original natural Sound ”. Tube KT88 x 4; 6N8P x 4; 12AX7B x 2. User-selected amplifier modes, UT (Ultra linear) mode provides greater output power and TR (Triode) mode does smooth and rich sound. Triode state: 2x 30W (8 ohm). Nobsound®——Douk Audio. HiFi Art-Elfidelity. Hi-Fi Tube Amplifier. Integrated Amplifier. Digital Amplifier. Headphone Amplifier. Audio HiFi & DIY. AV Tube Integrated Amplifier. 2A3C is compatible with 2A3 and 2A3B. Direct heating cathode and low power consumption. Output Tube: 2A3C x2. 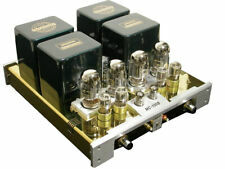 The amplifier sounds like a best single-ended tube amp should, detailed, warm and crystal clear. Audio output signal : 2.3V (± 0.5dB). Frequency response : l0Hz-30kHz (± 0.3dB). In order to provide you the best service. Use the excellent stable multilayer filter circuit, effectively remove the digital signal to your hi-fi music signal output. DAC AM architecture in the new era of high-performance decoder chip, AD1853., with excellent performance, and can provide full-balanced interface. Headphone output hole also uses a professional headset, you can directly drive high-end headphones. (Ghentaudio have already released over 40 kinds of audio interconnect cables. ghentaudio's Audio Cables Nice shape, Small size, Big power, I guess ICEpower a/s would agree too:). 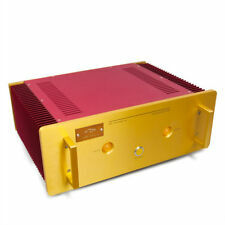 Well designed forStereo Power Amplifier, based on the latest ICEpower Class-D technology. Input and output fully balanced line preamplifier. There is a slight low noise, although there will be no effect when playing music. We will continue to improve. Because we are a manufacturer, we dare to say our shortcomings. A YAQIN MS-650B. Electron Tube:845 × 2 12AT7 × 2 12AU7 × 4. Frequency Response:10Hz - 32KHz(-2dB). Output Power:15W 15W(8Ω). Input Power: 110V-240V AVAILABLE. In order to provide you the best service. Output Tube: 2A3B x2. 2A3C is compatible with 2A3 and 2A3B. Direct heating cathode and low power consumption. Two triodes can be used for class A and AB amplification. The amplifier sounds like a best single-ended tube amp should, detailed, warm and crystal clear. Douk Audio——————All THE BEST！！！. Hi-Fi Tube Amplifier. Integrated Amplifier. Digital Amplifier. Headphone Amplifier. Audio Accessory. Nobsound®——Dou​k Audio. Tube amplifier board. Xiang Sheng 708B Vacuum Tube Hi-End Tube Headphone Amplifier Pre-Amplifier. This is assembled tube preamplifier & headphone amplifier, which used Tube : 6N3 6N11 2 6Z4. Headphone output impedance: 32-600 ohm ( suggest to use mix of high impedance headphones). HiFi Art-Elfidelity. 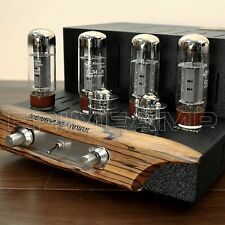 Hi-End KT88 Class A Push-pull Tube Amplifier Audio HiFi Stereo amp 50W 50W. 3, using KT88 tubes do class AB1 push-pull power amplifier ;. Triode way to work :sound soft ,pure and smooth, for viewing the human voice, stringand other types of music ;. This tube Phono Amplifier is base the famous Classic Marantz 7 RIAA amp Circuit. the sound is very good. 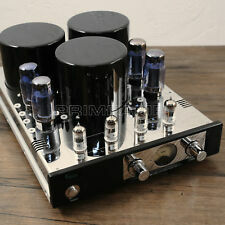 The MM Phono Amplifier are using 3pcs 12AX7 Tubes.Rectifier tube is 6X4. Note: this is only a MM Phono Amplifier. Small, compact and robust, the Bacillus is a precision grade headphone amplifier that comfortably adapts to any impedance headphones. audiophile grade op-amp. Precision Headphone Amplifier. Headphone impedance: 8-600 ohm. The maximum output power for 18w. Output power: 18W 2 (Ultra linear connection). Output core adopts imported 0.35 audio dedicated iron core, fold thickness 86-50 core, the magnetic flux 13000. 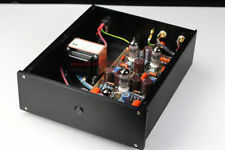 1pcs ×Finished tube amplifier. YAQIN MC-84L Hi-end Tube Integrated Amplifier. CLASS-A - Yaqin MC-84L Integrated Headphone Amplifier. These EL84 produce a very nice mid range. will bring yourself to heaven. Frequency : 6hz to 60khz. Ghentaudio have already released over 40 kinds of audio interconnect cables. ghentaudio's Audio Cables Well designed forStereo Power Amplifier, based on the latest ICEpower Class-D technology. Stereo 500w x 2ch(4Ω), or 250w x 2ch(8Ω), bothBalanced XLR and RCA input connections. YAQIN MC-100B KT88 Hi-end Tube Integrated Power Amplifier. CLASS-A - 100% New Yaqin MC-100B Integrated Amplifier. A YAQIN MC-100B unit. Switchable from 60 watts Ultra linear to 30 watts pure triode mode. Output transistor for original SANKEN geminate transistors 2SC3264 SSA1295, he main capacitor ELNA FO AUDIO 10000UF, ensure a strong dynamic and abundant energy. Damping factor: greater than 3000 @ 8 ohms. Headphone Amplifier. Hi-Fi Tube Amplifier. Digital Amplifier. Integrated Amplifier. Fully Balanced Headphone Amplifier Digital XLR/RCA Stereo Amp HiFi Audio Preamp. Speaker Protection Board. 1× Headphone Amplifier. Utterly reveals the elegance and refined timbre of the 300B Class A Single-Ended amplifier. Bowei-300B Hi-End Class A Tube Amplifier Its performance is best illustrated with Violin, saxophone, piano, vocal, Jazz, Classical, etc. YAQIN MC-6P1P Integrated Headphone Amplifier EXPORT VERSION. YAQIN MC-100B SV KT88 Vacuum Tube Hi-end Integrated Power Amplifier 110v-240v US. YAQIN MC-100B BK KT88 Vacuum Tube Hi-end Integrated Power Amplifier 110v-240v US. Power output: 30 watts per channel into 8Ω (stereo). Frequency response: 5Hz to 35kHz. In case of malfunction or any other problem we try hard to solve the issue. Total harmonic distortion: 2%. Malfunctions / Operations issues . AUDIOROMY "M-838" 845. Tube : 845 × 2, 6L6GC x 2, 6N4 x 2, 12AU7 x 1. Output Power : 22W x2(8 ohm). Warranty:One year factory warranty extra three years factory parts warranty. (Amplifier Only). Distortion : Less than 1% at full power. YAQIN MC-100B KT88 Hi-end Tube Integrated Power Amplifier. CLASS-A - 100% New Yaqin MC-100B Integrated Amplifier. A YAQIN MC-100B unit. YAQIN MS-88B KT88 Class A Hi-End Vacuum Valve Tube Integrated Amplifier 120-240V. YAQIN MS-110B KT88 Tube Integrated Amplifier. Valve / Tube : KT88 x 4 / 12AU7 x 2 / 12AT7 x 2. YAQIN MC-13S SVSV EL34 Vacuum Tube Push-Pull Integrated Amplifier NEW MC-10T US. Type : Integrated Amplifier. 1× finished amplifier (default not included AC power cable). Toshiba 5200/1943 transistor parallel output, strong thrust, detailed sound. very delicate natural sound. original K170J74differential pair transistors. AUDIOROMY M-805 Integrated Amplifier. Tube : 805 × 2, 6L6GC x 2, 6N4 x 2, 12AU7 x 1. Output Power : 35W x2(8 ohm). Warranty:One year factory warranty extra three years factory parts warranty. (Amplifier Only). Hi-Fi Tube Amplifier. Integrated Amplifier. Digital Amplifier. Headphone Amplifier. Tube amplifier board. Finished amplifier ×1. EL34 Tube Amplifier. 300B Tube Amplifier. YAQIN NEW MC-10L MC-13S EL34 x 4 Vacuum Tube Hi-end Tube Integrated Amplifier GB. CLASS-A - 100% New Face Yaqin MC-13S Integrated Amplifier. YAQIN MS-88B KT88 Class A Hi-End Vacuum Valve Tube Integrated Amplifier 120-240V.